DELPHOS- What would you do with 75-100 trash cans? For Craig Mansfield that is just one aspect he oversees to ensure that local public areas are clean and safe. 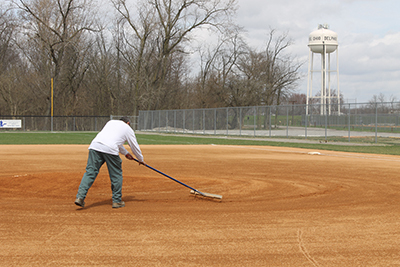 Mansfield, the Delphos City Parks and Recreational Superintendent, is busy preparing the local parks and pool for use come summer time. Mansfield supervises nearly 100 acres, including all of Delphos’ parks and reservoir. It would take one person two to three days to mow the entire reservoir. Fortunately, Mansfield won’t have to do it all alone. Mansfield revealed that they would begin filling the pool at the start of next month. The plan is to open the pool Memorial Day weekend, weather permitting. Mansfield stressed that the temperature must be above 68 degrees. The building of the new pool house will be complete before the pool’s opening, but Parks and Recreation has nothing to do with its construction. “Once the new pool house is built, it will also be maintained by Parks and Rec employees,” Mansfield added. The pool is scheduled to close Aug. 18. The Splash Pad has a slightly different schedule than it’s neighbor the pool. It will open earlier than the pool and remain open after the pool closes. This is, again, weather willing. The difference is that while the Splash Pad is open by itself it is free to the public. However, while the pool is open the only way to access the Splash Pad will be through admission to the pool. Parks events will take place throughout the summer. These events include Music in the Park beginning June 9, the Delphos Relay for Life June 14, the Kiwanis 4th of July Celebration July 3 and 4 and the Little, City and Pony League baseball tournaments, also on July 4. The shelter house also hosts various events, such as family reunions. Summer personnel are tasked with maintaining and cleaning all public areas at least once a week. Trash cans are emptied one to two times a week. Mansfield was adamant of their maintenance schedule.